Joe Satriani + The Aristocrats’ Tours: Still Forever! I love our SHOCKWAVE tour set and can’t wait to share it with you in a city hopefully close to you soon. Hello out there! 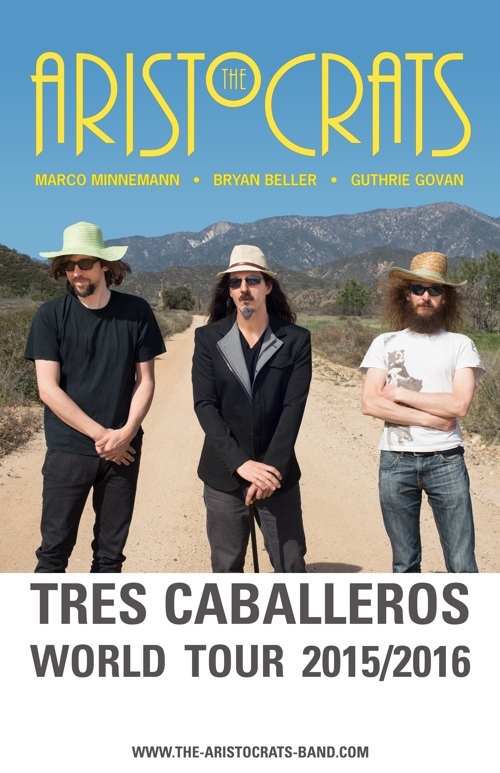 While Marco and Bryan tour Europe with Joe Satriani, and Guthrie tours Asia doing clinics, the buildup for the “TRES CABALLEROS” EUROPE TOUR continues. It’s being split into two legs, before and after the winter holidays, and most of the dates are now in (with lots of Italy left to confirm in mid-February). The first date is just over a month away. Our very prestigious team of medical experts from around the world has analyzed the situation and offered the following official advice on the matter: Get tickets now and tell your friends. Full info and ticket links for all dates can be found by clicking here. If for some reason you missed the whole thing about us releasing our third studio album TRES CABALLEROS, the medical experts have a different prescription: Check it out here and then get your copy here. They say that this is not the kind of condition you should leave unattended and are quite serious about this, it seems. Bonus news for those still reading: The chances are VERY good that we will be touring SOUTH AMERICA for the very first time ever, in May of 2016. The medical experts are also saying that people in Mexico, Colombia, Chile, Argentina, Uruguay and Brazil might want to check back soon for further advice on this very important issue. We wish everyone the best of health and hope to see our European friends soon! Plenty more to come there, all the way into late April. The Aristocrats’ South American tour *should* follow very shortly thereafter. I don’t really have much else to say, other than, yeah, it’s nuts. But it’s great. And hopefully I’ll see you soon somewhere. I hope you’re all doing really well!